A rope knurl is just a knurl made with a concave knurl so that a series of raised ridges wrap around a half round (or less) hump. This photo shows how it should be done (taken from a SawMill Creek article by Leigh Betsch, well worth reading but requires a log in to view the images). Flat and convex knurls are easy to come by but rope ones are not and this one was home made. I haven’t advanced that far and use a flat knurl and rotate it around the hump to make the rope, sometimes holding the tool by hand (brass is pretty easy to knurl, titanium is difficult). Here is a knurl holder similar to what I use, with two flat, angled knurls; the angles are opposing to form a cross hatch. The holder is mounted on the cross slide and jammed into the work and the knurls form (and cut) the pattern. I use a one arm of the holder and one of the knurls to make my ropes, rotating the holder to get all sides of the hump. I usually have to reverse the work to get at all sides. Not quick and takes a bit of finesse to make sure I get the grooves lined up (otherwise you can get ghosting or double grooves). 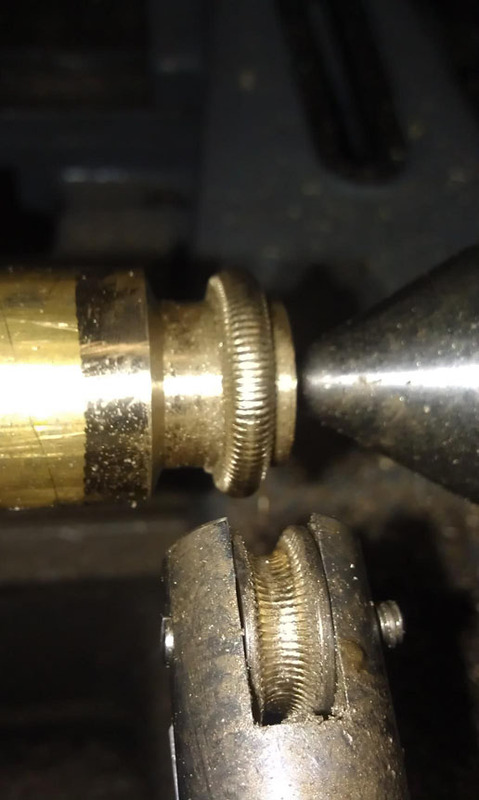 I now use a different knurling tool that works much better than a push tool, see it here. Thanks for the additional information. I appreciate the link to using a tap to help make the initial knurling tool.